In celebration of May as Older Americans Month, we’re taking a deeper look at the multifaceted realm of aging: people, programs, and plans for the future. The first in the series focuses on what millennials (the generation following Gen X—with birthdates from the early 80s to the early aughts) need to know about aging. As it becomes harder to parse aging issues from national issues, more and more young people are taking a stake in the challenges facing older adults as shared challenges of navigating American life. Here are six things we need to know today and tomorrow. Over 1 in 4 of today’s 20 year-olds will experience a disabling condition before they retire. Almost 9 million people with severe disabilities that prevent them from continuing to work receive benefits from Social Security, as well as 2 million of their dependents. This means that you could be relying on Social Security much sooner than in 30 or 40 years. Our younger generation is passionate about movements like Equal Pay Day and paid family leave because we see their immediate impact. They are also aging issues as the more we do to remedy inequality in the workforce today will help us all throughout our lifespans. Due to the rising cost of child care, millennials entering parenthood are finding that paying for daycare isn’t feasible. This is particularly the case when their hourly wages are barely more than the hourly cost of daycare providers. Compounded with the long-standing socioeconomic expectation that childcare is a disproportionately female responsibility, young women continue to leave the “traditional workforce” for a work-at-home role caring for their children. However, leaving the traditional workforce has long-term effects on retirement. One study shows that women who took just one year out of the workforce sacrificed 20% of their earnings. Women who take two or three years earned 30% less. As these losses of earnings magnify over time, women age into retirement with much smaller savings than men. Currently, a higher percentage of older women live in or near poverty than men (10.7% compared to 6.7% for men). We want to think of this gender inequality as a unique issue for previous generations of women who tended to have lower wages, shorter working hours, and took longer career breaks. The reality is that the existing systemic inequality means that today’s young women continue to face challenges in preparing for retirement. Similar to the issues surrounding equal pay, Social Security does not adequately compensate for caregiving, meaning, that women (and men) who leave the workforce to care for children or elderly family members may not receive the credits they need for social security. The National Committee to Preserve Social Security and Medicare (NCPSSM) dubbed this the Social Security Glass Ceiling, in a report by Caroll Estes and Terry O’Neil. Further, in order to qualify for a divorced spouse benefit, the spouse must meet the “duration of marriage test,” meaning the marriage must have lasted for a minimum of 10 years. 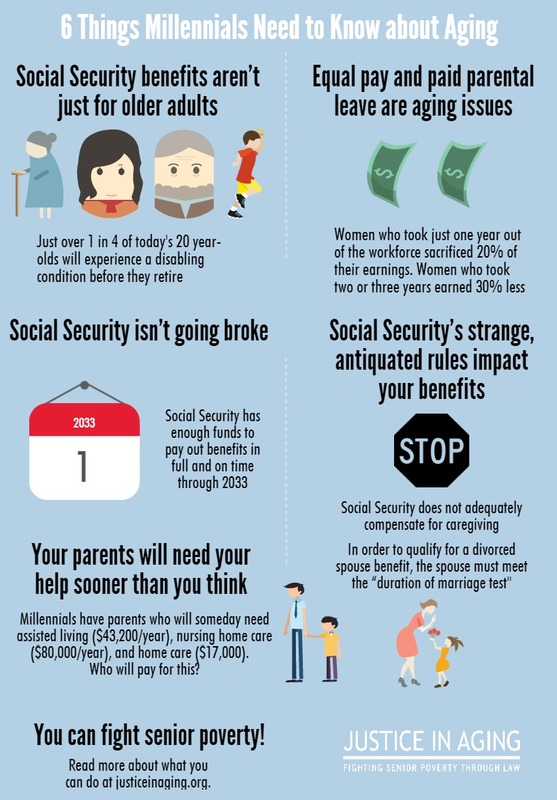 Few millennials know about these dated Social Security rules and the impact of life events on their retirement. Millennials are often accused of being coddled, adulthood delayers, “peter pan” children who still rely on their parents for support. However, at a certain point we millennials will be our parents’ caretakers; as is, we are wholly unprepared for the role. When we talk about the Lost Generation, the recession’s crushing impact on millennials’ lower wages and sky-high educational debt, we should also factor in the lack of support for our parents’ long-term care. We have parents who will soon need long-term care that comes with a high price tag: assisted living ($43,200/year), or nursing home care ($80,000/year), or home care ($17,000). Who will pay for this? Our younger generations simply cannot take on the challenge of paying for our parents’ long-term care without protecting and improving the programs and services we rely on: Social Security, Medicare, the Older Americans Act. Social Security has enough funds to pay out benefits in full and on time through 2033. If Congress does not act before 2033, revenue continuing to come into the system would still cover about 75% of scheduled benefits. 7 out of 10 Americans support a package of improvements that would ensure that Social Security could pay out full benefits for at least 75 years, including gradually, over 10 years, eliminating the cap on earnings that are taxed for Social Security, and over 20 years, raising the payroll tax rate that workers and employers each pay from 6.2% of earnings to 7.2%. 6.3 million older Americans are living in poverty. But young people can turn the tide with their voting power and strong online presence. You can support policies that preserve economic security programs and access to health care and sign our petition to get your voice heard. Share this post with your social media network and help spread our vision for Justice in Aging for all people. Special thanks to Katrina Cohens, Fay Gordon, and Kate Lang for their contributions to this post.